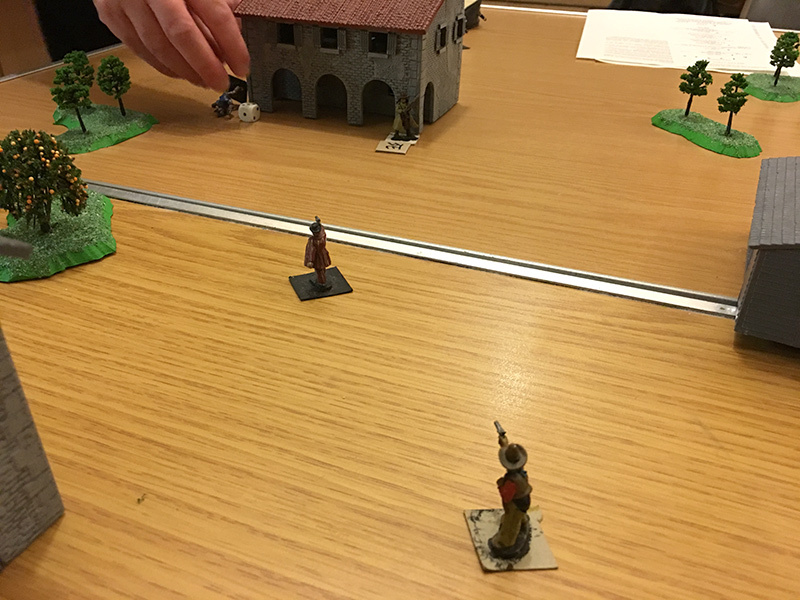 A couple of weeks ago my gaming buddy at the wargames club suggested we try out some Wild West wargaming. 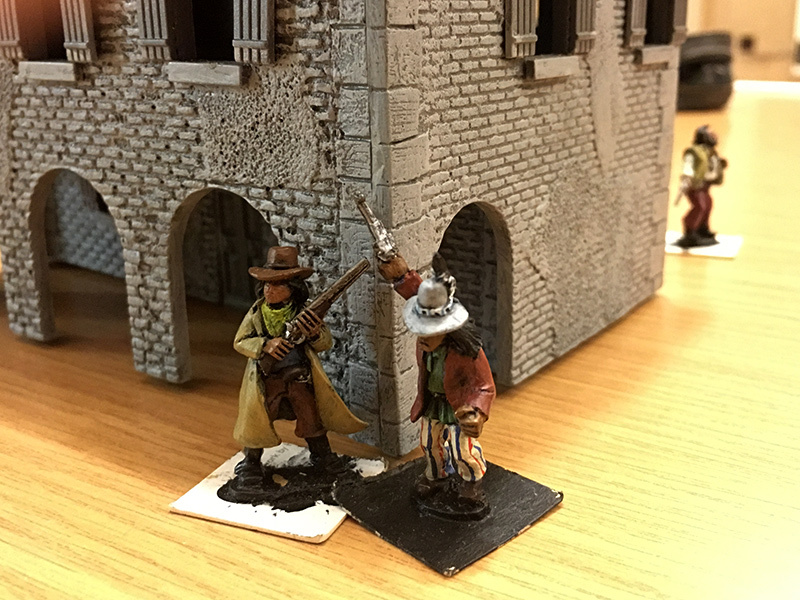 I don’t have any figures suitable for Wild West wargaming but Mark has a nice little collection. 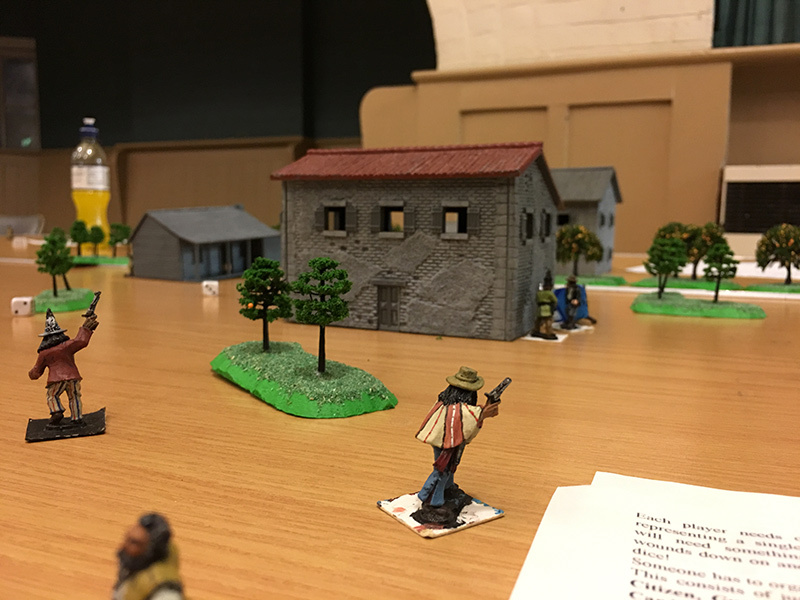 He pointed me in the direction of “The Rules with No Name”, a set of suitable rules for Wild West Skirmish wargaming. The rules are by Brian Ansell and date from the 1990s. They are freely available online. Wargames Foundry took them over and turned them into a commercial rulebook. I presume they have been updated and fancified and are now available as a book with lots of colour illustrations. 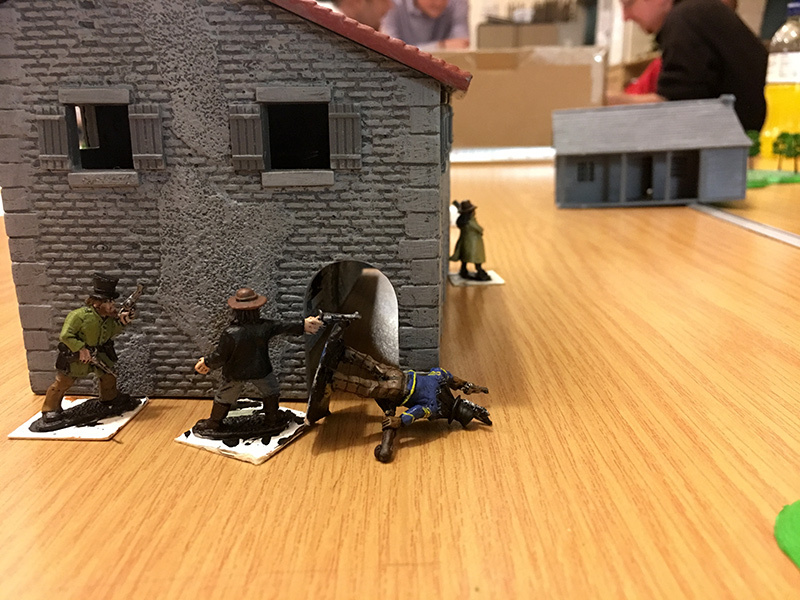 They go for about £25 but if you want the original version you can still download it free of charge at the wargames Foundry website – The Rules with No Name. We tried a game and I really enjoyed it. The rules are quite simple. In order to get going you only need the first few pages which include a weapons range chart and a hit/damage chart. We played with six figures a side. The characters are split into 4 levels each with different characteristics and skills; Citizens, Gunmen, Shootists and Legends. As you’d expect the Legends have the best qualities while the Citizens have the least. 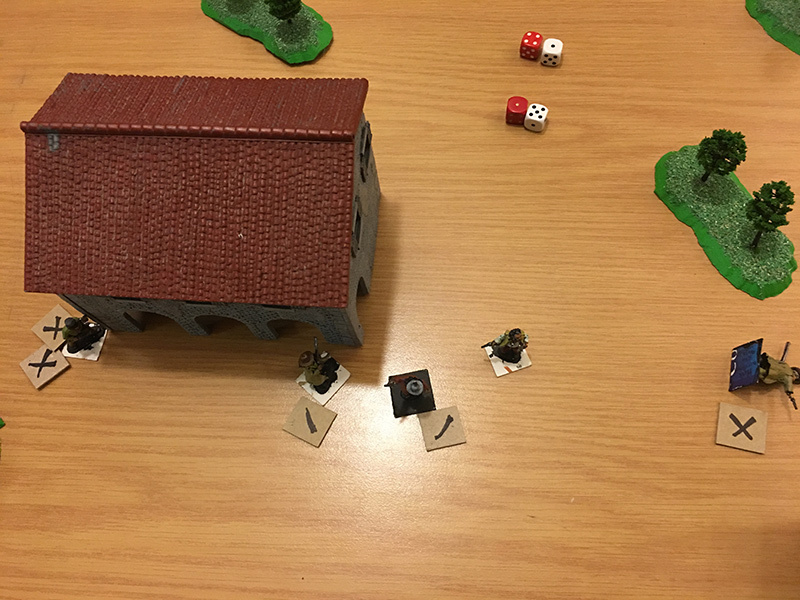 Firing is based on dice throws. Only a six is a hit and if you get a hit you throw two dice, one for the part of the body hit and the other for the seriousness of the injury. So if you get a six for a hit then you’ll roll for damage, a one would be a hit on the head and a further one would be a graze injury while a six would be a kill. You can get hits in the head, chest, left/right arm and left/right leg. A record is kept of injuries and further movement/chances of using a weapon can be dependent on how many or how serious the injuries are. Instead for modifying the dice hit as in other games, where you might need a 4, 5 or 6 to hit and take off one for behind cover, add one for a particular skill etc, in the Rules with no Name you only ever hit on a six but you get extra or less dice as modifiers. 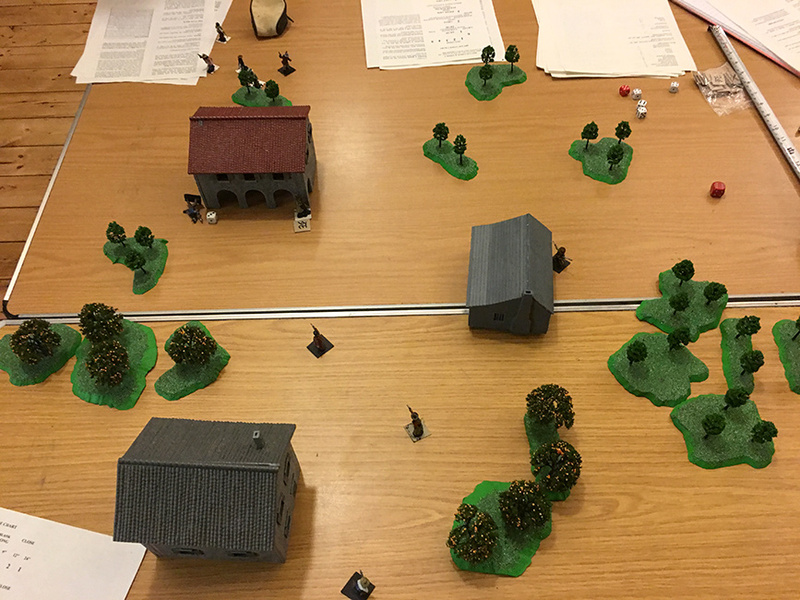 So a rifle at medium range might have three dice add two dice because the character is a Shootist, remove one dice because he moved before firing so the players throws five dice and a six is a hit. As you get used to the rules you can dd extra rules. So our third game was yesterday and we introduced skills to our characters. A skill adds something to each character’s capabilities. I enjoyed the first game so much that I bought some wild west building plans and have started making buildings. I’ currently doing four but eventually will have enough for a whole wild west town. This week, despite saying I don’t need to buy figures for yet another genre, I ordered a dozen figures from Artizan and am looking forward to them arriving soon.